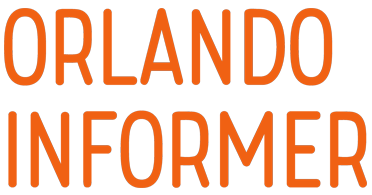 Although Portofino was Universal’s first on-site property, having opened with most of the rest of the resort all the way back in 1999, the hotel received a facelift in 2013, with every guest room getting a renovation and new Despicable Me-themed kids’ suites being added. Keep reading to learn more about the Minion rooms and all the accommodations at Universal Orlando’s Portofino Bay Hotel! Relax in comfort in one of the hotel’s standard garden-view rooms, each offering a lovely vista of the meticulously-manicured and -landscaped grounds. 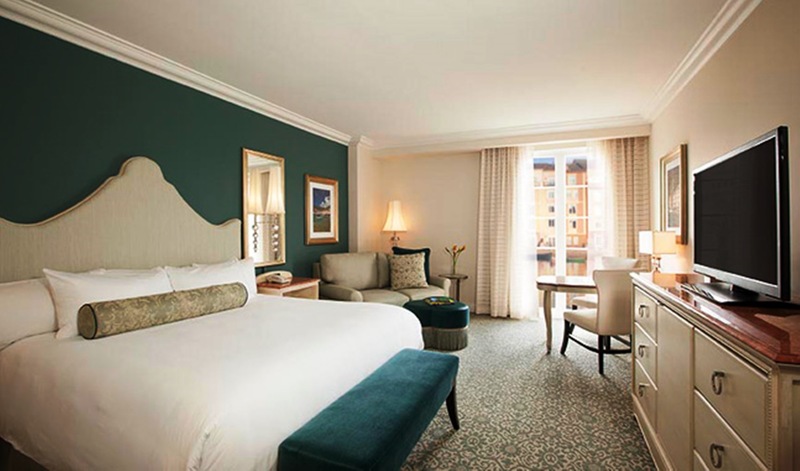 Every guest room features marble accents and elegant furnishings from Italy. Garden view rooms come with either a king bed or two queen beds and offer plenty of room to luxuriate at a spacious 450 square feet. Open your window shades and find yourself in the heart of the Italian Riviera. 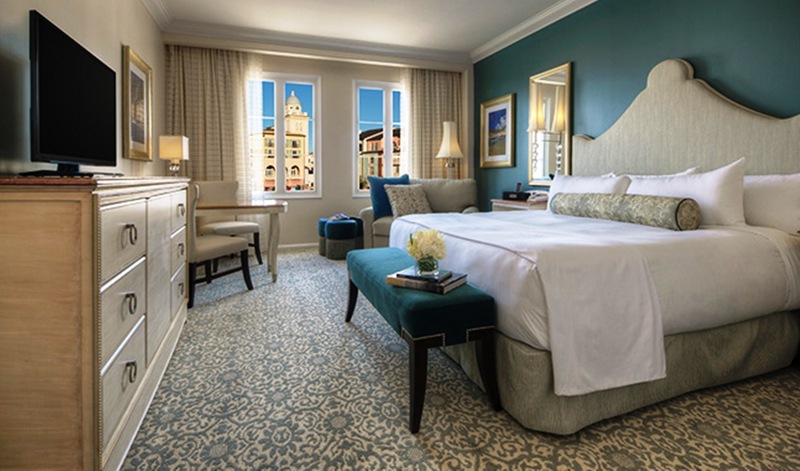 Bay-view rooms overlook the hotel’s scenic Portofino Bay and picturesque Harbor Piazza. Every morning, you can look out and watch the sun glittering off the sparkling water and its fleet of colorful fishing boats. Like the standard garden-view rooms, the bay-view rooms are 450 square feet and offer a choice of a king or two queen beds. These elegantly-appointed accommodations offer an even larger living space at 490 square feet, plus a stylish and roomy bathroom featuring a separate tub and shower. In addition to the extra comfort, you’ll enjoy a view of the serene Villa Pool and surrounding gardens, or the dramatic Roman aqueduct-styled Beach Pool. The kids’ suites let Mom and Dad have a little privacy and the kids have some fun! With a standard king bedroom for the adults plus a separate room for the kids, there’s plenty of space for the whole family (a combined total of 650 to 675 square feet). The children’s room connects only to the adults’ room (there is no entrance to the hallway) with a door that can be kept open or closed. 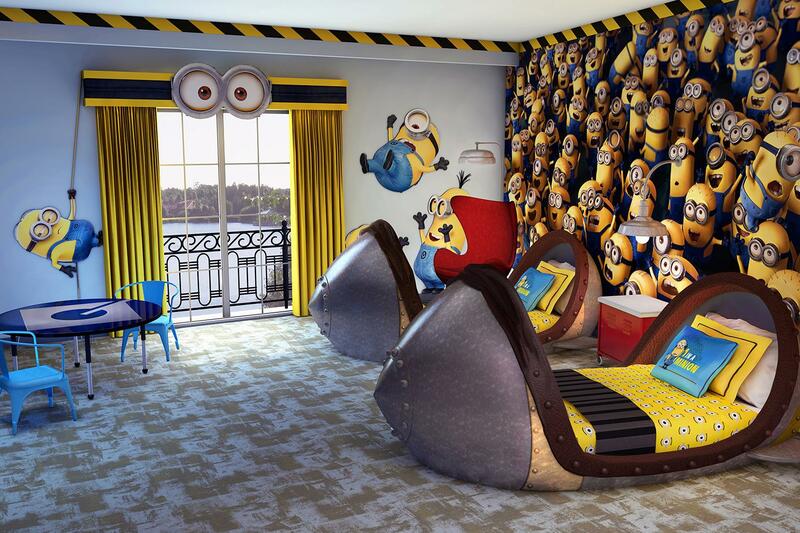 The world’s first and only Despicable Me-inspired hotel suites can only be found at Loews Portofino Bay Hotel. The suites bring to life the excitement and playfulness of Gru’s house, featuring missile beds with Minions-inspired bedding (so children can sleep like Gru’s adorable girls – Margo, Edith, and Agens) and Minions who rappel from the ceiling and surround guests with their unpredictable antics. A pale blue interior creates a soothing backdrop, while touches of Gru’s laboratory’s red accents remind guests that they are, indeed, in an unforgettable Minion adventure. 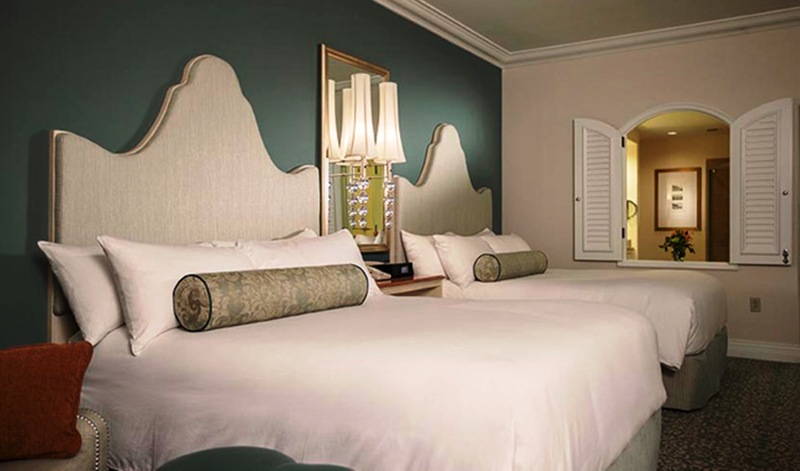 The adults’ room features a king-sized bed in the hotel’s newly-renovated Italian luxury design. We should note that all of the venue’s 18 kids’ suites have been given the Despicable Me makeover. 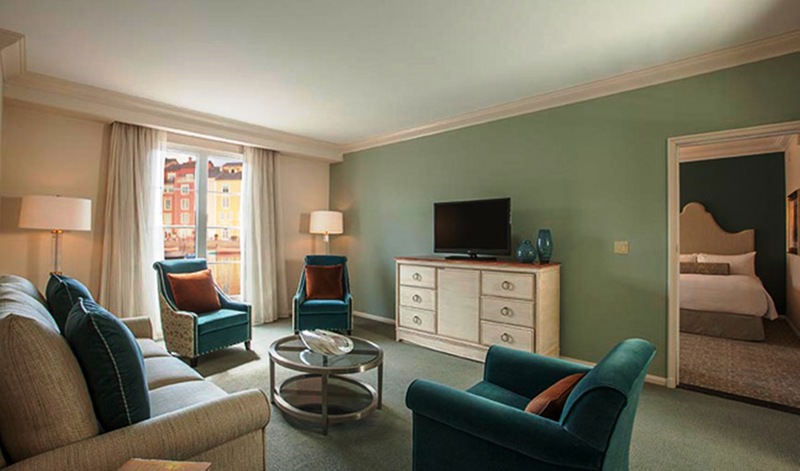 The Portofino suites are cozy and comfortable, with plenty of space to relax after a day at the theme parks. These suites have a 280-square-foot parlor, which adjoins to a 450-square-foot garden-view bedroom. A second adjoining garden-view room can also be reserved to create a two-bedroom suite. Vacation in style in one of the property’s roomy Villa suites. You’ll enjoy a casual seating area, a dining area, and a kitchenette. The 620-square-foot parlor features an adjoining 490-square-foot deluxe bedroom. A second adjoining room can also be reserved for a two-bedroom suite. 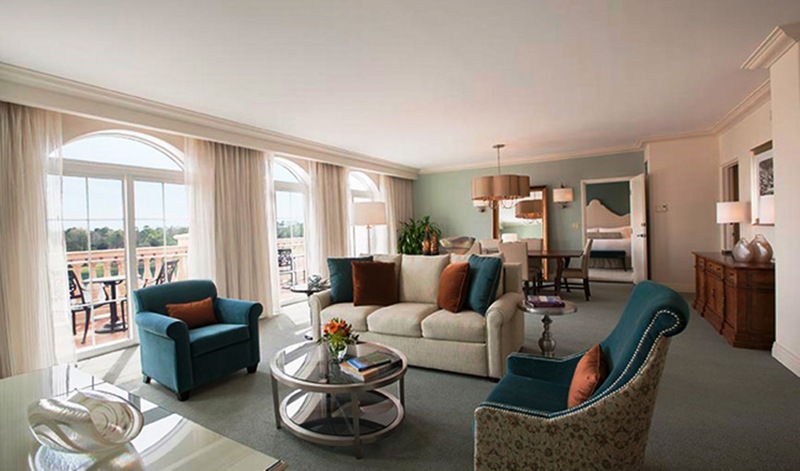 It’s all the comforts of home, in the heart of Universal Orlando. Upgrade your stay with us to enjoy access to the Portofino’s club lounge, and you’ll enjoy the utmost in European hospitality and service. You’ll receive special room amenities, access to the exclusive club-level lounge conveniently located near the lobby, and other benefits and privileges. 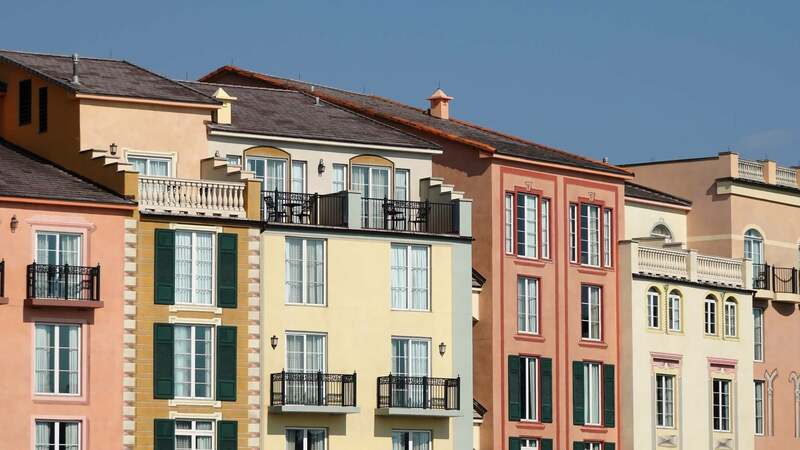 Portofino Bay is the only on-site hotel at Universal Orlando with rooms that feature balconies – however, these are few and far between. Rooms with balconies cannot be reserved in advance, but may be offered as an upgrade at check-in: $15 extra per night for a “Juliet” balcony, and $30 extra per night for a full balcony. Juliette and full balconies at Portofino Bay Hotel. 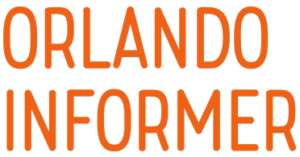 Please note that there is no additional charge for a room with a patio or walkout area to a public space (these are by request, too – they cannot be specifically reserved). 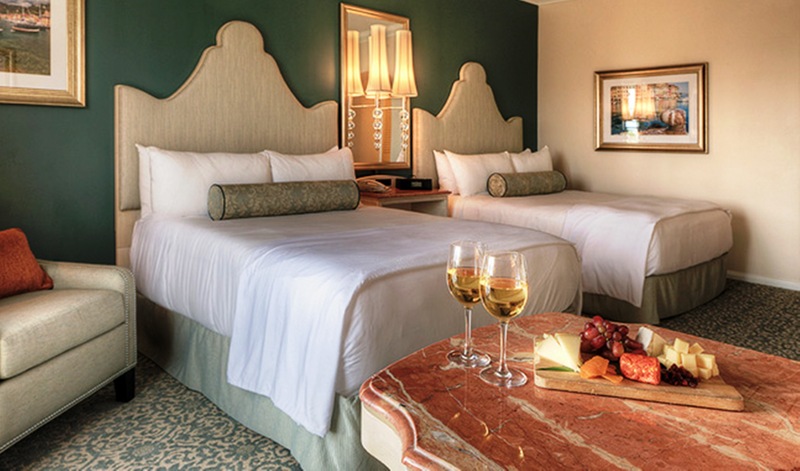 Portofino Bay Hotel also offers Hospitality, Governatore, and Presidential suites. Please contact the hotel directly for information about these accommodations.